It’s official: we’re engaged! 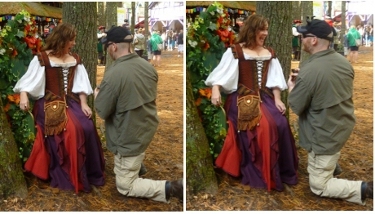 At this year’s annual King Richard’s Faire visit, my partner of five years managed to surprise me, jaw drop included. And it’s not like he and I haven’t discussed getting married; we have, but I was surprised nonetheless. The thing is, I was married and divorced long ago, so I was also never in a hurry to repeat it. But what I have now is so different from my past. And the question was delivered from such a loving and authentic place, saying yes was easy. Jaw-dropping surprise followed by JOY. The romance of the situation was not lost on me at all. 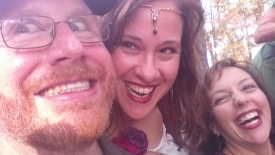 A mutual friend introduced us at King Richard’s Faire, so it’s our annual “anniversary thang.” 🙂 We go, usually with a gang of friends, and leave reality at the gate. It’s a great day of silly fun … I LOVE that he chose to propose there. I’m girly-vain enough to enjoy that I was wearing a costume that I love and in which I feel beautiful. Not to mention, KRF for me is simply infused with wonderful memories—the romance of the gesture just lit me up. I’m also thrilled that Mike made sure that my best friend was there to share in the joy … AND to take lots of great photos. Take a look at my face, people, after the surprise, that’s JOY! Although getting to a place of authentic joy in a personal relationship has been a journey for me, for sure, I don’t claim to be unique or alone in having needed to get past smashed dreams, heartache, feelings of betrayal, and the subsequent feeling of never wanting to open up again and trust enough to fall in love. But, the beautiful thing about being human is that once we start healing personally, the rest does sort of fall into place. Mike and I didn’t fall in love with each other until we’d both made some peace with ourselves. The gift of joyful laughter! Another surprising gift evolving out of this new state of being is the knowledge that I want to feel that same authentic joy I felt when he proposed in many more facets of my life—it feels damn good! Feeling that authentic joy is crystallizing my motivation to choose happiness, to make decisions that are for my best good and that bring joy. I know that I want joy on a daily basis. I don’t want to wait until I accomplish just one more thing or wait for a particular something else to happen. I am deciding that joy is a priority. I also know I’m the ONLY one who can make it happen and it’ll take some practice. Joy can be found in things large and small, I just have to consciously make the decision, and that will also require taking moments to feel gratitude for the tiny to grand blessings in my life. 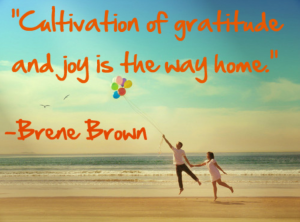 I know that when I cultivate gratitude, it allows me in any given situation to choose what will hold my focus—frustration or acceptance; restlessness or contentment; alienation or love. Our perceptions do create our realities. So, I’m going to continue to revisit what authentic joy feels like and invite it in as often, and in as many ways, as possible. 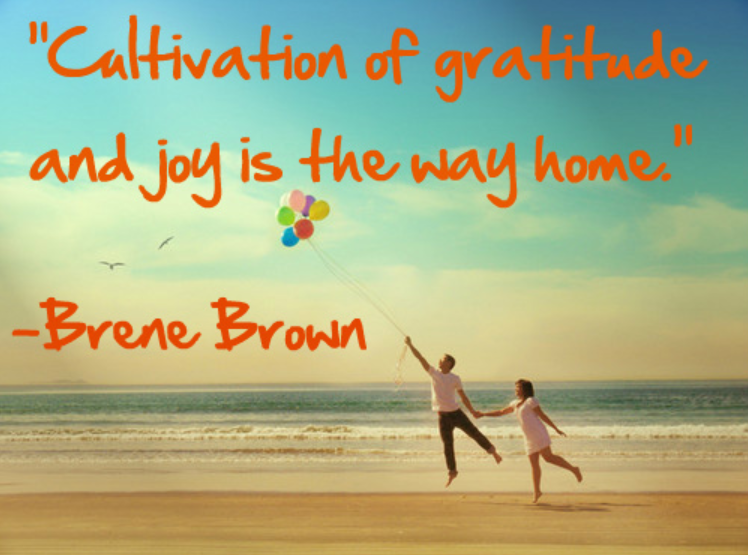 How do you cultivate joy in your daily life?